Lying in eastern Guangxi, the city of Wuzhou is 500 kilometers to the east of Nanning. The Tropic of Cancer runs through its urban area. The city has a time-honored history and convenient land and water communications. It is called a "water gateway to Guangxi." In the urban area, there are Baiyun (White Cloud) Mountain, the Snake Breeding Base -- the largest in Asia --, and other tourist attractions. Other scenic spots in the surrounding areas mlcude West Mountain in Guiping, Zhenwu Hall with a unique, imposing architectural style in Rongxian County, the enchanting Dagui Mountain in Hexian County, the Gupo Mountain Fore' Park. the charming rural scenery of Fuchuan, and Bishui Lake. Perched on top of Beishan Park, the memorial hall is a grand structure built in 1930 by combining China's palatial architectural style with the Western style. It is the earliest hall erected to the memory of Dr. Sun Yat-sen in China. In the exhibition room and the meeting hall are photographs and objects showing Sun's life. It is one kilometer west of urban Guiping and has West Mountain at the center. 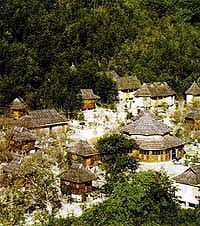 There are the site of the Jintian Uprising, the Longtan State Forest Park as well as Dateng Gorge, Baishi Cave Paradise, the Place of Happiness in Luocong, Zijing Yao Mountain, the Marker Tower of the Tropic of Cancer, and East Pagoda. West Mountain in Guiping is the "No. 1 enchanting mountain in southern China."